The circle on the left includes all of the standard features of Autism Spectrum Disorder. When children are very young, a Developmental Disabilities model is the best way to approach the problem (for example, getting the child to give eye contact, speak, and reciprocate social bids). As the child gets older, the atypical features tend to improve. At the same time, however, behavioral and emotional issues such as anxiety tend to become more evident, and in the long run these are the most challenging issues facing adults with ASD (even adults who have “recovered” from ASD using narrow behavioral criteria). 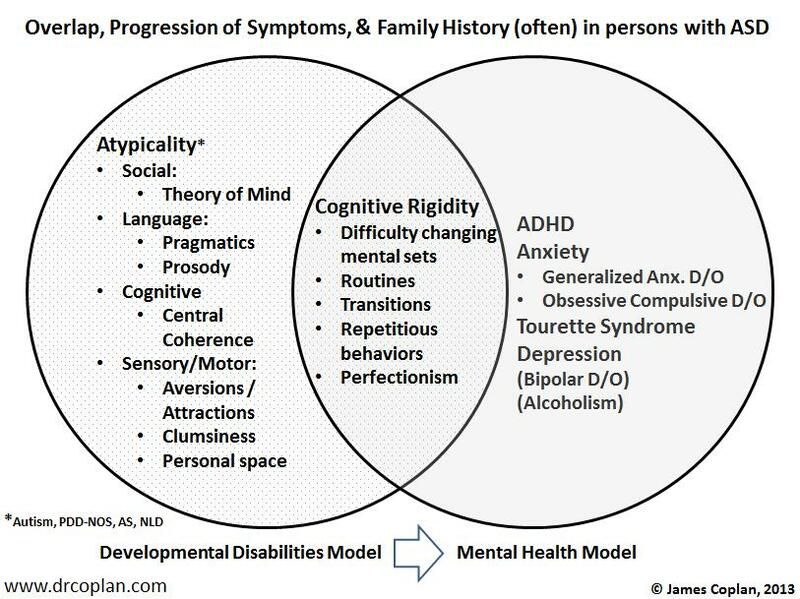 “Cognitive Rigidity” lies in the overlap zone between Atypicality (on the left) and Neuropsychiatric Disorders (on the right), and is evident in both. More on this the next time.